We have a 40 foot Class A Coach. We had a back-in space. While we had no problem backing in, it was very very tight. You are very close to your neighbors on three sides. We did have a full space for our tow vehicle —which is pretty rare. Most of the spaces are permanent tenants. Everyone that we met was very pleasant and welcoming whether it was staff or neighbors. The facilities were immaculate. We would stay here again. Whenever we visit Boise we will stay here. Friendly staff twice went out of their way to be helpful. Handicap shower was great. Found two great restaurants nearby and shopping center. This park seemed a bit older but exceptionally well maintained. Our visit was only overnight but the facilities were comfortable and very clean. Overall a great experience. Stayed there going and coming on our trip to the coast. Reasonably priced and everything listed on their site is just as pictured. Always appreciate it when good service is provided and nice space to stay in. Would not hesitate to stay again. This is a lovely park. We had a pull through site which was just across from the office, rec room, laundry, pool and dog park. They have a large rec room with TV, pool table, kitchen and a fairly large library. The laundry is spotless with 6 washers and driers. They even had a Bocci Ball court! I have to say they have the best dog park I have ever seen. It is quite large, fenced and has grass. It is conveniently located right in the middle of everything. Dogs were having a great time all day long! I did not rate the restroom because I did not use or see those facilities. There was one branch hanging from a tree which created a little difficulty when we were pulling in, but the crew cut the branch and some others down the next morning. They were very responsive. They were going to prune the entire tree the morning we left. They didn't want to do it while we were parked there. They were busy pruning several trees throughout the park while we were there. They keep it well maintained. The office staff and maintenance staff couldn't have been nicer. We would definitely recommend trying this park. Great campground with great facilities and employees. Only very small issue is that the sites aren't completely level. Other than that minor detail, the place is a must stay. Close to everything but at the same time, far enough away. I highly recommend. This is, without a doubt, the nicest park in Boise. It's located near some nice, safe neighborhoods, and is convenient to all things Boise. The grounds are well taken care of. The park has many long term residents but the sites are neat and clean. The short term sites are a little narrow but long enough. We do have to park our car sideways with our 45 foot motorhome. Sites are a little close to each other for my comfort but they are sufficient. There is the occasional siren or other road noise but it's pretty quiet at night. The staff is always pleasant and helpful. WII FI (the dreaded Tengo Internet) works … most of the time. However, once we contact the office they fix the problem, and we are back online. Verizon coverage is fine. Definitely recommend this RV park. We just bought our first motorhome, actually our first RV. We had to make an overnight trip to visit family in Boise. 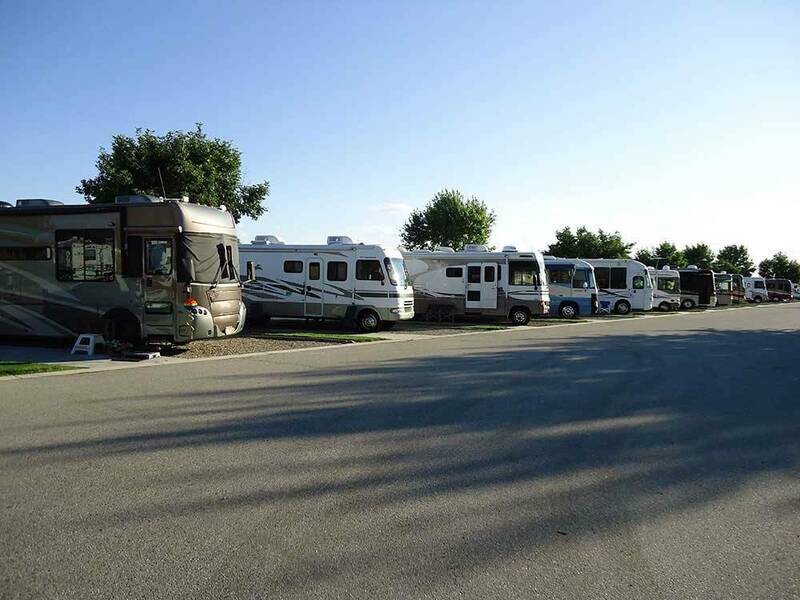 Making the reservation was easy, when we arrived I informed them this was our first trip to an RV park and we had just bought our class A motorhome. We were escorted to our site, across from the dog park, the pool and the bath house. They stood by while we set up, offered advice and were as friendly and as helpful as can be. We will be making regular trips to the area to visit family and this will be the location we stay. We just stayed one night, but I really thought it was nice. The sites are close together, but other than that, everything was great. We had a level site with a patio and table. Every thing was clean and the folks were very friendly. I will stay here again next time we come to Boise.